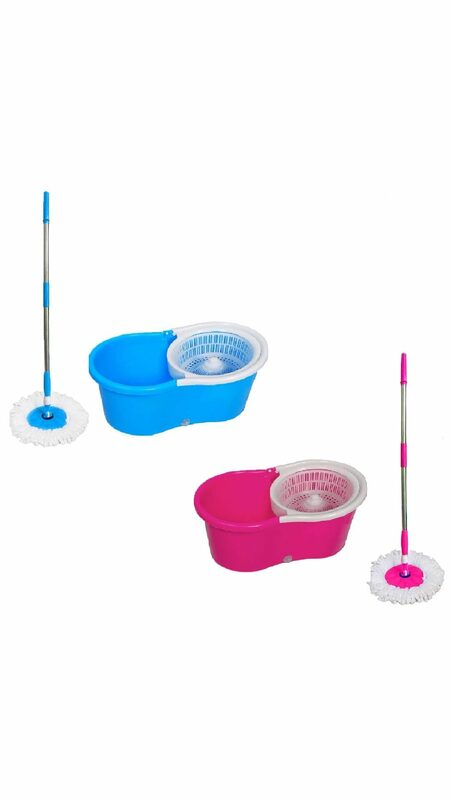 Comes with rinsing bucket & handle with mops head high quality & machine washable. This spin mop set leaves your floor spotless and your hands grime-free every time. The long stainless steel handle clean those hard-to-reach places, the absorbent mop head locks-in dirt ad mess from your floor. The spinner bucket works as a dryer - it squeezes. The water removes dirt out of the microfiber mop cleaner (spool), so that the mop is again ready to clean the floor. The process takes just few seconds and requires no electricity. The cleaning part of mop is made up of microfibers having more capacity to soak water. This one is safe for all types of flooring, as it soaks up big spills and shifts stubborn scuff marks in seconds. When used dry, it attracts dust and dirt particles like a magnet. The super-large, 360 degree rotating mop head allows you to cover more surface area and other hard-to-reach places and corners with ease. Large places like malls/halls/bungalows can be cleaned easily and without pain.